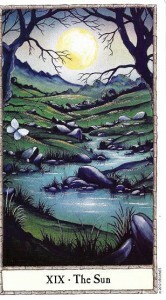 “The Hobbit Tarot” that is. Come on, stick around, the tarot is totally worth reading a few minutes more. 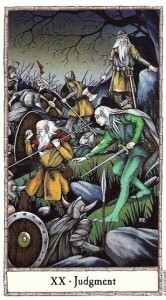 Now let’s get to the main event, “The Hobbit Tarot” by Peter Pracownik and Terry Donaldson. Readers may remember that all the way back in 2010 I was fortunate enough to review the “Imperial Dragon Oracle” that was done by Peter Pracownik and Andy Baggot. 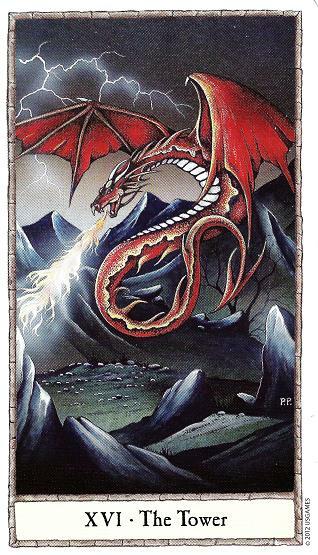 I spent some serious time lavishing praise on the art done by Peter Pracownik and mentioning that he did all the fantastic art for the collectible card game “Wyvern”. (You know, like I just mentioned here.) That trend of praise will continue. Pracownik’s art is so enchanting that I had difficulty picking just a few cards that he illustrated to share. Believe me, it look serious work to narrow it down to five, which may be the most cards I’ve ever scanned to share for a tarot deck ever! I couldn’t help myself! Look at “The Sun”. What a beautiful, darling landscape. Or what about the battle scene depicted on “Judgment”? It looks like it is right out of an ancient book of tales. I mean, if you imagined opening up an old, weathered, leather bound book of ancient tales of yore, that’s absolutely the illustration you would expect to see. Am I right, or am I right? Along those same lines, say hello to the “Knight of Swords”. 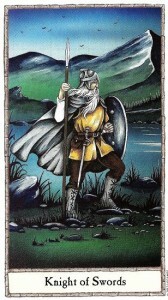 He would be the hero in the before mentioned illustrated book of ancient tales. Now you can’t have Pracownik do art for you without there being a dragon! Thankfully “The Hobbit” has one. 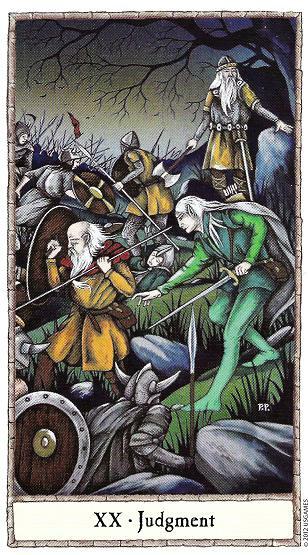 My repeated commenting on how the artist could be illustrating a book of old tales leads me to believe that obviously this is why Pracownik is the perfect choice to do the art for “The Hobbit Tarot”. Tolkien’s work is essentially ancient tales. The road of life leads each of us through our respective Wilderlands. We see Mirkwood in the distance. The forest is where our Companions receive their initiations, teachings, and new skills; where they all become heroes of a sort, by confronting their fears and limitations. On the surface, everything looks so peaceful and welcoming. But we must be ready for the challenges and contradictions that life may throw at us as we move along the road that is our life journey! Donaldson finds spiritual insight in “The Hobbit” that tarot lovers and Tolkien fans alike should appreciate. 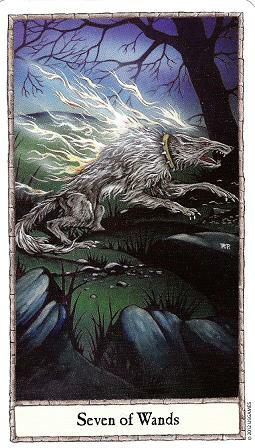 Speaking of fans, I happen to love Wargs, the oversized wolves that appear in Tolkien’s work. So I couldn’t help sharing/boasting that there are two cards featuring Wargs in “The Hobbit Tarot”. And just to prove I’m not a liar, here is a sneak peak at the movie “The Hobbit”.